Drum Legend Buddy Rich was one of the main reasons that I'm playing drums today. Not only did he have a technical mastery of the drumset but he played with an intense energy, a fire that has often been imitated but never duplicated. This DVD brings together three great drummers with members of the Buddy Rich Big Band and special guests Will Lee and Luis Conte, to recreate some of the tunes from Buddy's original repertoire. Let's check it out. Buddy's Big Band "I Don't Care Anymore": Phil Collins plays this medium tempo swing tune. Phil, who has made his mark as a legend not only in drumming but as a vocalist and composer, had initial reservations about performing with Buddy's Band when he was first asked by Cathy Rich, Buddy's daughter. But, being a fan of Buddy's and of big band drumming, Phil eventually put a band together himself. That experience gave him the confidence to play with Buddy's Band and he does a fine job for a rock drummer. (Just kidding, Phil!) He does a fine job - period. Buddy Rich Drum Solo from 1945: This brief teaser clip shows Buddy in his favorite mode as a soloist with the Tommy Dorsey Combo! Buddy's Buddies "Airegin": Steve Smith plays with a small group of musicians from Buddy's Big Band (known as Buddy's Buddies) and they really cook on this one. Buddy on The Steve Allen Show 1957: Another brief clip of Buddy doing his solo thing. Buddy's Buddies "No Jive": Steve Smith does justice to this funky tune complete with extended solo. Buddy Rich from 1986: Another brief clip of Buddy in action on the tune "Bugle Call Rag" from a performance in Copenhagen, just a year before he passed away. "Rocky and His Friends": Dennis Chambers with the big band. Check out the drum solo on this one. Buddy Rich from 1983: A brief clip of Buddy playing "Birdland" from a gig in Jacksonville. "Mercy, Mercy, Mercy": Phil Collins plays one from Buddy's repertoire with the big band. "That's All": Phil Collins plays again with the big band. "Norwegian Wood": Phil Collins plays Buddy's big band arrangement of the Beatle's hit. "Milestones": Phil Collins again with the Buddy Rich Big Band. Buddy Rich from 1984: The master himself playing an extended solo during "Channel One Suite" in a performance filmed in Berlin. Drum Solos: Phil Collins and percussionist Luis Conte take turns. "Birdland": Phil Collins and Luis Conte perform with Buddy's Big Band including Will Lee on bass. "Sussudio": Phil Collins plays one from his own repertoire with the Buddy Rich Big Band. "The Way You Look Tonight": Phil Collins sings and dedicates this classic to Buddy's wife and his daughter, Marie and Cathy Rich. Credits: These credits roll over some cool rehearsal footage. Buddy Rich Big Band personnel: Trumpets (Scott Wendholt, Dean Pratt, Tony Speranza, Craig Johnson), Trombones (Rick Trager, Rick Stepton, George Gessalein), Saxophones (Steve Marcus, Andy Fusco, Bob Bowlby, Walt Weiskopf, Jack Stuckey), Piano (Joel Weiskopf), Bass (Will Lee), Percussion (Luis Conte). Executive Producer: Randy Davis for Manhattan Center Productions, Produced by Rob Wallis and Paul Siegel for Hudson Music, Concert Produced by Cathy Rich and Co-Produced by Steve Arnold for Scabeba Entertainment. Bonus Songs: Three songs, totaling nearly half an hour, are included: "Big Man's Blues" with Steve Smith, "New Blues" with Dennis Chambers, and "Nica's Dream" with Steve Smith. About Hudson Music: Information on Hudson Music. WWW Links: Valuable links to music and drum sites on the World Wide Web. 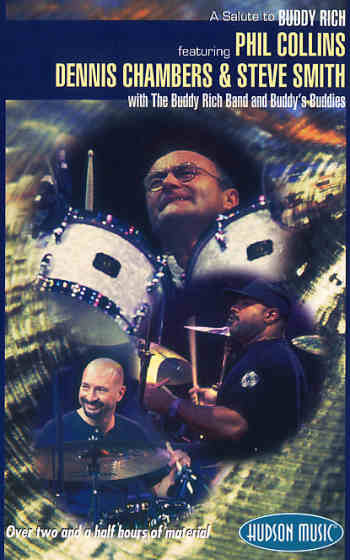 Buddy's music is timeless and ageless, much like Buddy himself, and this DVD features interpretations of his classic charts by three of the world's most infuencial drummers. Thanks to Cathy Rich and the rest of those involved in producing and filming events like this, Buddy's music and drumming genius will remain alive for generations of drummers to come. If you're a Buddy Rich fan and would like to see more of the master himself in action, be sure to check out the DVDs listed at the top of the right hand sidebar on this page.